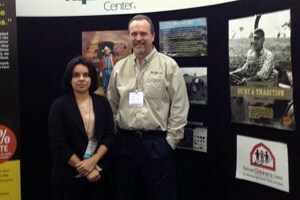 UMASH attended the Professional Dairy Producers of Wisconsin Business Conference, March 12-13, in Madison. Yurany Ninco Sanchez (left), the National Farm Medicine Center’s new bilingual community outreach trainer, spoke with farmers about the center’s free dairy worker training, which underpins a UMASH research project. Ninco Sanchez, Scott Heiberger and Tammy Ellis staffed a booth where they distributed resources that included the UMASH needlestick fact sheet for workers. They also conducted a preliminary survey of dairy producers regarding child care for their workers. Nearly 1,500 producers and other professionals registered for the annual event, held at Alliant Energy Center.